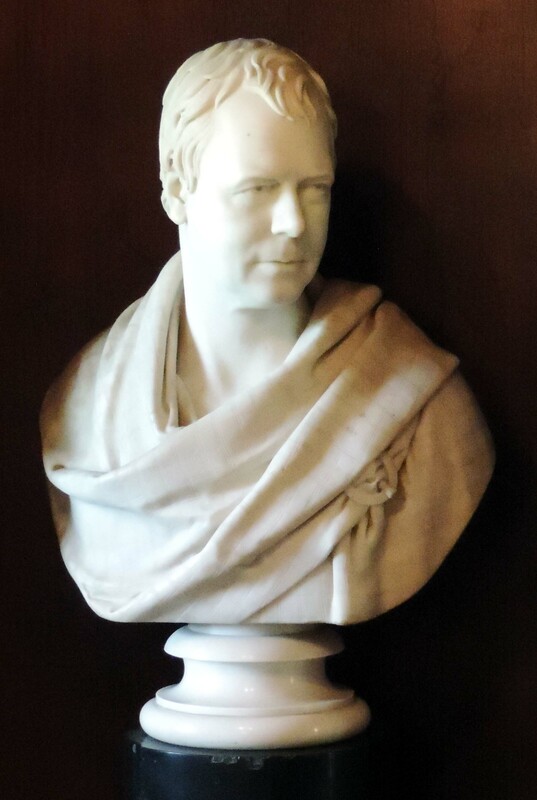 I had better start this post with a confession – I have never read anything by Sir Walter Scott, the Regency’s favourite author and the man who almost single-handed created the historical novel genre as we understand it today. 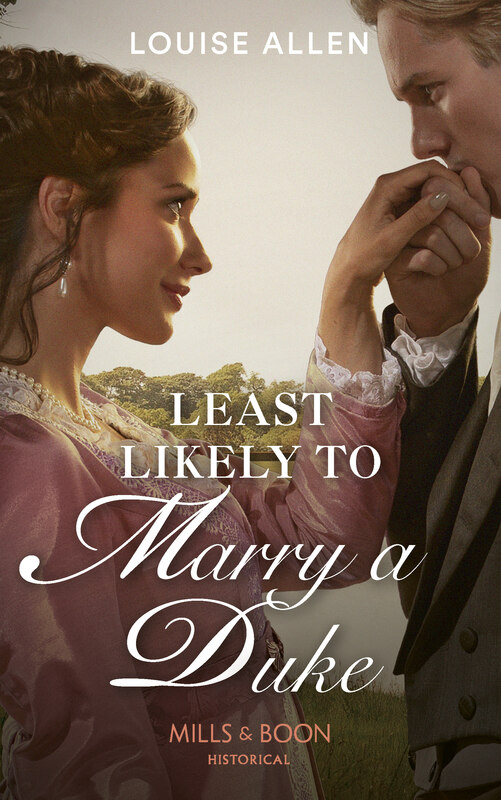 And that is bad of me, because for someone who writes historical novels and who specialises in the Regency, I should have done. And I will read some, just as soon as I’ve met my current deadline. 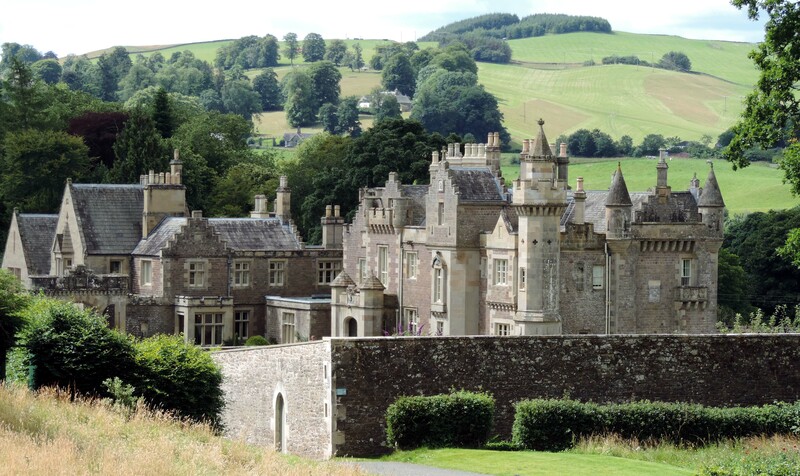 We were driving back from a touring holiday in Scotland in August when I looked at the map and saw Abbotsford marked, dredged in my memory, came up with Scott and suggested we visit. My husband grumbled that he knew nothing about Scott (he’s a zoologist, so he has an excuse), so I had better fill him in while we were driving there. All I could come up with was that Scott was blamed for the excesses of the “tartan and shortbread” Scottish tourist industry, had been hugely prolific, wildly popular with the reading public and had got himself into vast debt. We had encountered him on numerous occasions when researching for Following the Great North Road (available for Kindle) because he was a constant traveller between Scotland and London, considering the Swan at Ferrybridge to be the best inn on the Great North Road. He was also kicked in the head by his horse while drilling with the Edinburgh Light Horse at Portobello just outside Edinburgh (and also on the GNR) and finished The Lay of the Last Minstrel while confined to bed recovering. None of this amounted to much of an introduction, let alone an explanation of why Scott was so popular at the time and still has such a grip that Abbotsford has become a literary shrine. The visit to the house was preceded by an excellent exhibition in the visitor centre, so we studied that and got the basic facts straight. Scott was born in 1771 in Edinburgh to a very respectable professional family. (Lawyers, medics, professors). He spent his first four years in Roxburghshire while recovering from the polio that left his left leg permanently affected and this encounter with Borders history apparently fired his precocious imagination. He returned to Edinburgh for his education, became a rather unsuccessful Advocate and then was appointed Sherriff-Depute of Selkirkshire in 1799. He was already writing poetry and was obsessed with Scottish history and legends, so this new post was ideal, giving him the opportunity to travel widely. He wrote his vast Minstrelsy of the Scottish Borders (1802), followed by epic poems The Lay of the Last Minstrel (1805), Marmion (1808) and The Lady of the Lake (1810) which proved hugely popular with a reading public whose tastes were embracing the romantic and who were fascinated by wild and rugged landscapes. But poetry was not enough for him, and besides, Byron was beginning to encroach on his territory. He turned to fiction with Waverley (1814), Guy Mannering (1815), The Antiquary (1816), The Heart of Mid-Lothian (1818), The Bride of Lammermoor (1819) and Ivanhoe (1820). He was also writing essays, lyrics, short stories, historical and biographical work and highly-regarded critiques of contemporary fiction – he reviewed both Emma and Frankenstein, for example. Despite being staggeringly prolific in his writing, Scott was still holding the Sherriff-Depute post and needed a base for his travels that would also accommodate his family. In 1812 he bought Newarthaugh, a farmhouse “on a bare haugh and bleak bank by the side of the Tweed.” It was small for a man with a wife and four childr en, but he started by making only small changes to the house, which he renamed Abbotsford, instead buying land to increase the estate from 110 acres to 1,400. Money was no object – it was pouring in from his writing – and Scott could afford architects and builders, artists and craftsmen. He also collected voraciously, acquiring books for his wonderful working library, which survives intact, and curios and historical pieces. There are too many to do more than just mention a few – a cast of the skull of Robert the Bruce, the original keys to Edinburgh’s Old Tolbooth prison, the gaol door and some of its stonework, oak panelling from Dunfermline Abbey and a piece of oatcake from Culloden battlefield are amongst the wealth of historic, curious and just plain odd items. 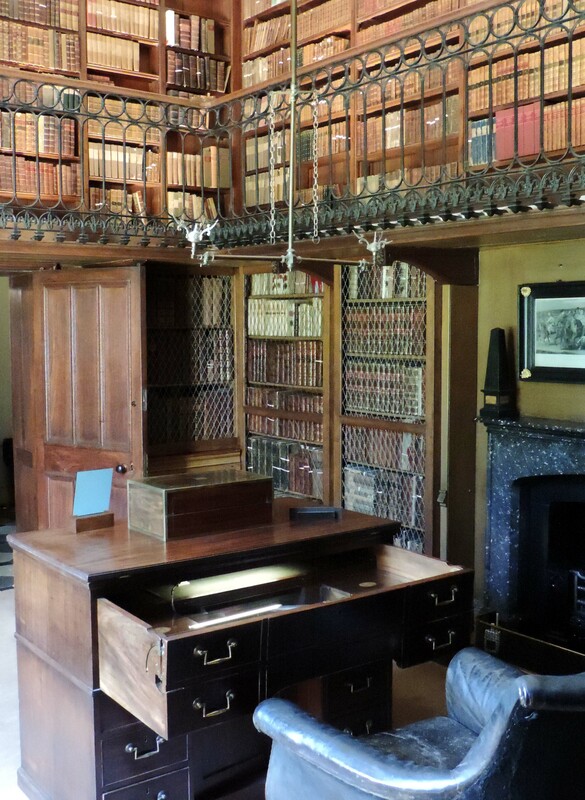 The great hall, is shown left, Scott’s study is below, right, and the library, below left. Scott could afford to indulge himself with his building and collecting until disaster struck in 1826. His publishers, Archibald Constable of Edinburgh, went bankrupt and Scott was financially involved through a partnership. There was no limited liability in those days and Scott himself was bankrupted. But in an extraordinary move the creditors allowed him to write himself out of debt. Abbotsford was put in trust and the Scott family permitted to remain there while he worked – “My own right hand shall pay the debt.” From then on he worked relentlessly, despite the death of his wife and his own failing health. By the time he died in September 1832 the debt was virtually cleared. 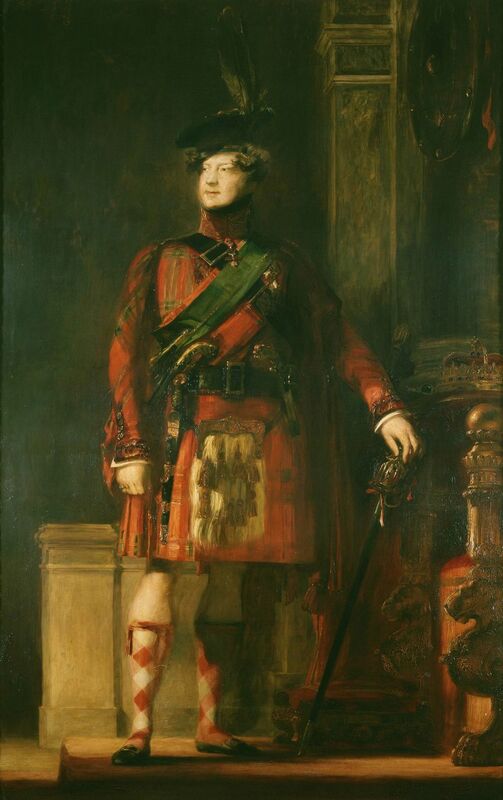 Scott is often “blamed” for the outbreak of tartan-itis that culminated in Queen Victoria’s obsessive use of the pattern at Balmoral and the proliferation of tartan tourist goods today, but this stemmed from his efforts to help George IV. George, who was not such a fool as he is often portrayed, wanted to heal the rifts between England and Scotland that led to the Jacobite rebellions. He wanted to throw himself into Scottish history and completely bought into Scott’s romantic vision of the Scottish past. When he visited in 1822 the Edinburgh city council commissioned Scott to stage manage the event and he created a wonderful show, including assisting the king to dress in tartan, which had been outlawed since the 1745 rebellion. Despite the fact that George managed to create the most ludicrous version of Highland dress that a portly middle-aged man could ever have worn (shown here in a detail of the portrait by Wilkie), this was an important gesture and enthusiasm for tartan as a potent symbol of national identity surged. Four years before the royal visit, in 1818, Scott had used the then Prince Regent’s enthusiasm for his work to petition him to allow a search for the “Honours of Scotland” – the Scottish crown jewels. In 1707, the Act of Union between England and Scotland decreed that they must always remain in Scotland. 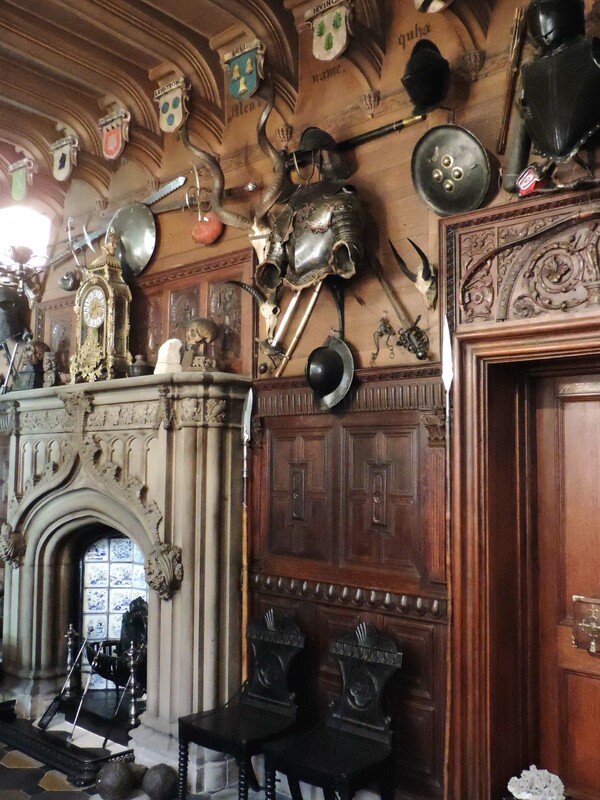 But there were fears that they might become a symbol of Scottish independence, so they were put into a strongbox in the Crown Room of Edinburgh Castle which was then locked, barred with double doors, and the key conveniently ‘lost’. George agreed to Scott’s request and the room was broken into, the chest opened and the crown, sword of state and sceptre – the oldest surviving crown jewels in Europe – were found safely inside. 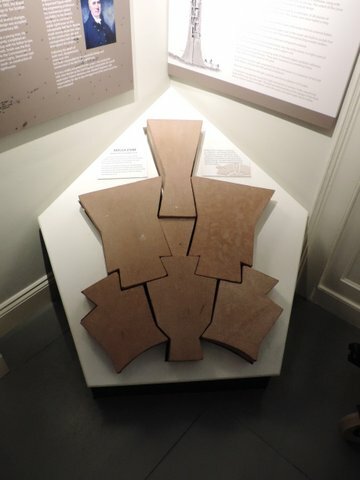 They still remain in Scotland today, on display in Edinburgh Castle. 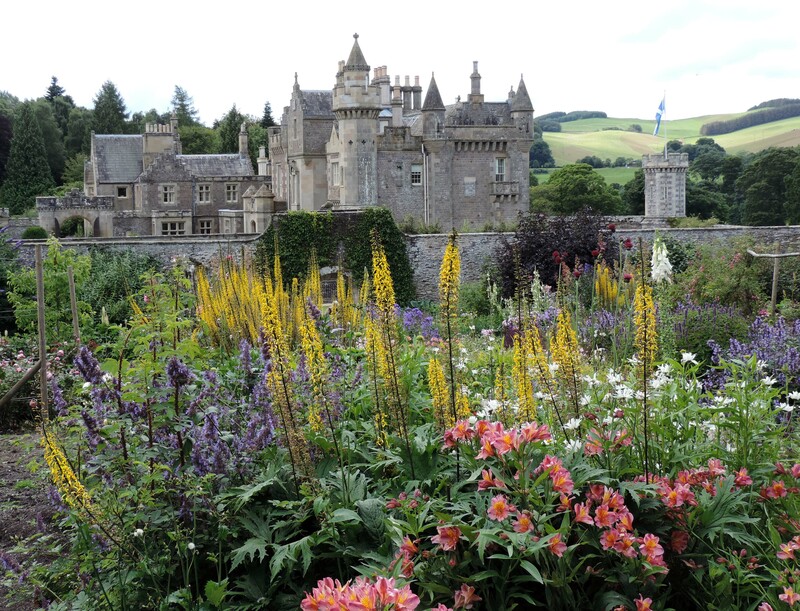 Abbotsford House remains essentially as Scott left it, although with some 1850s extensions at the side. 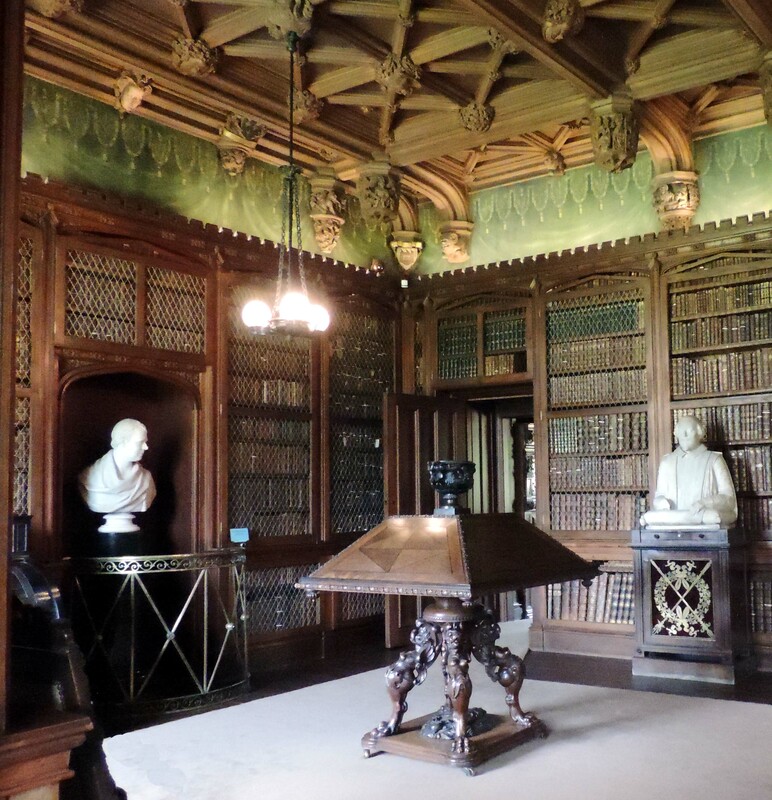 But his study, the library and the wildly eccentric great hall feel as though he has only just walked out to stroll beside his beloved River Tweed for some more inspiration. I’m back north of the Border again for today’s blog, visiting an engineering feat by one of Regency Britain’s greatest engineers which, although located in Scottish waters, imust have been a wonder for the entire country. When I was in the delightful little fishing port of Arbroath ( in pursuit of the famous and delicious Arbroath Smokies) I spotted an elegant and unmistakeably Regency building on the shore. It looked like a miniature lighthouse but turned out to be the signalling station for the Bell Rock lighthouse and home to the families of the lighthouse keepers. Bell Rock is 11 miles (18 km) off the coast at Arbroath and is part of the lethally dangerous Inchcape reef that had proved a major hazard to shipping on this busy coastal route for centuries. In the Middle Ages an abbot had a bell fixed to a floating platform anchored to the reef, which was some warning, but the frequent storms repeatedly destroyed it. The reef is virtually invisible except at low tide when about four foot of it is above the water. Building a lighthouse seemed an almost impossible technical feat, but following the loss of HMS York with all hands in 1806 pressure grew for a solution. In that year a bill was passed through Parliament for a stone tower at a cost of £45,000 to be paid for by a duty on shipping between the ports of Peterhead and Berwick-upon-Tweed. Two of the greatest engineers of the day were inv olved – John Rennie, who as Chief Engineer, was responsible overall for the project, and Robert Stevenson, who as Rennie’s assistant and the resident engineer, risked his life on the reef along with the workmen. On shore the signalling station allowed communication with the lighthouse and provided a home for the keepers’ families and accommodation for them when they were not on duty. Now it is an excellent little museum all about the Bell Rock and its construction. 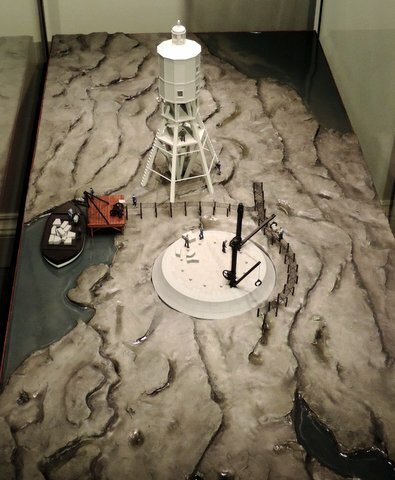 This photograph is of one of the models in the museum showing the difficulties that Stevenson had to overcome to build the lighthouse. First a wooden tower was built to house the men when the tide came in and then, whenever there was low water, they came out onto the exposed reef and worked on the tower itself, building it up with a jigsaw of interlocking stone blocks that had been cut during the winter months when no building could take place on the rock. The ingenious design of the blocks is shown in this model. Despite the dangers and difficulties the tower was completed in only four years and became operational in 1811. It has been in continuous operation ever since, saving innumerable lives. These days the light is fully automated. Robert Stevenson (1772-1850) was educated at a charity school when the death of his father left the family almost destitute. His future career was determined when he was fifteen and his mother married Thomas Smith, a tinsmith, lamp maker and mechanic who was engineer to the Northern Lighthouse Board. 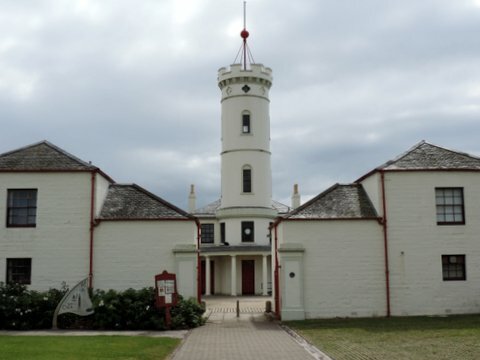 Robert became his assistant and by the age of nineteen had built his first lighthouse on the River Clyde. Bell Rock is considered his masterpiece, but he was responsible for many other lights as well as roads, bridges, harbours, canals, railways, and river navigations. Three of his sons followed in his footsteps as civil engineers and his grandson was the writer Robert Louis Stevenson. 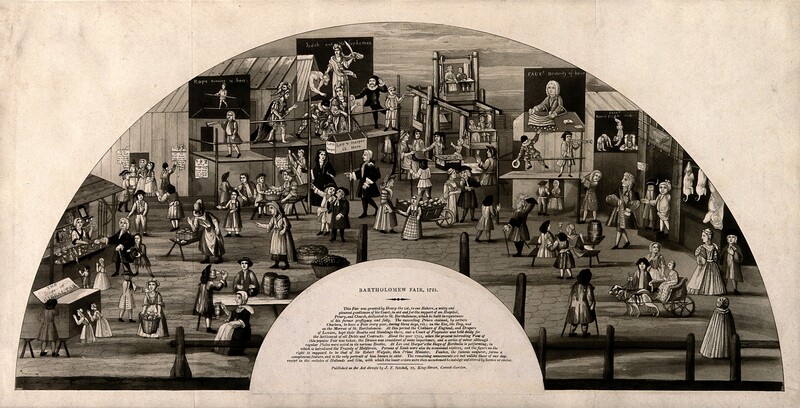 The George Cruickshank monthly print for September is a lively image of the Bartholomew fair, held at Smithfield from 1133 until Victorian moral outrage finally suppressed it in 1855. Its origins were in the cloth fair which provided much of the income for the priory and hospice dedicated to St Bartholomew that eventually became today’s Bartholomew’s Hospital (“Barts”). The fair, one of the largest in the country, was held for three days from the eve of St Bartholomew’s Day (24th August). With the change of calendars in the 18th century the date slipped to 3rd September. At the same time as the cloth fair the Corporation of London held a cattle fair at the same site and eventually, after many wrangles and the Dissolution of the monasteries, the Corporation took over the whole event. By the 17th century the fair was more a vast funfair than a cloth or cattle sale and even the Puritans did not try and shut it down. By the time Charles II was on the throne it lasted for three weeks of carnival and downright disorder. Everyone, rich or poor, went to the Fair, including Samuel Pepys who records numerous visits over the years. On September 2nd 1664 he watched the rope-dancing and bought combs for his wife and her maids. Entertainments included theatrical performances, jugglers, magicians, stalls selling every kind of trinket, animal shows, food stalls, freaks and vast amounts of drink. The print for a fan dated 1721 shows a rather tidy and sedate fair, but does illustrate some of the activities – rope dancers, Faux the conjuror, rides in a dog cart, an early form of Ferris wheel, a peepshow of the Siege of Gibraltar and a stall selling “toys” – not children’s playthings but adult novelties and trinkets. Dolls known as Bartholomew Babies were one of the most popular souvenirs. Bartholomew Fair, site of St. Bartholomew’s Hospital, London, pictured in 1721. Aquatint with etching, c. 1800. By the later 18th century Richardson’s booth was considered to have the best theatrical entertainments. He charged 6d admission (most others only charged a penny) and the tent was lined with green baize, illuminated by 2,000 lamps and the ushers were dressed as beefeaters. One can be seen to the right of Cruickshank’s print. A visitor in 1825 records seeing “four lively little crocodiles hatched from eggs at Peckham by steam, Wombwell and his menageries [and] a glass blower in a glass wig blowing tea cups for 3d each.” An account of the money made by stallholders in 1828 gives an idea of the type of sideshows – the Pig-Faced Lady earned £150 (at 1d a time), the Panorama of the Battle of Navarino, £60 and the Chinese Juggler, £50. Wombwell’s Menagere made £1,500. 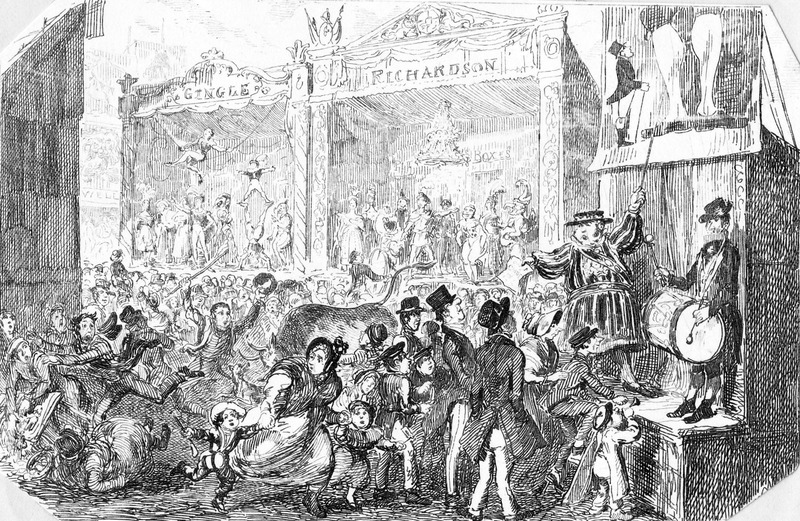 Cruickshank’s image shows a daytime scene with many children in the crowd – although even then the place is crowded and the bull-baiting appears to have got completely out of control. The coloured image by Pugin and Rowlandson for the Microcosm of London in 1801 shows a much darker, night-time scene, hinting at danger, debauchery and sin. The Victorians certainly did not approve. In 1840 a committee regulated the booths and increased the rents and forbade “giants and dwarfs”. City notables ceased their support and by 1850 it was so reduced that it was no longer worth having an opening ceremony. In 1855 it ceased to exist, leaving only its name as a bye-word for uncontrolled fun for every class.